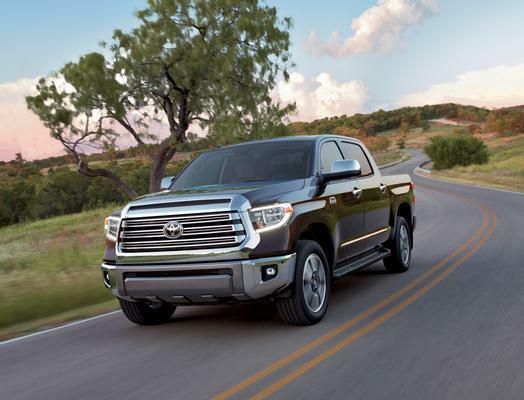 When you choose the 2019 Toyota Tundra, you’re not just getting a capable full-size truck. Many customers at Pedersen Toyota are more than satisfied with their Toyota Tundra, thanks to the comfortable ride, nice onboard systems, and plenty of room in the cabin. Visit our dealership and you’ll see our stock of new Toyota vehicles is excellent. Not only do we have the full Toyota Tundra line, we also carry the other trucks, SUVs, and cars you love. As you likely suspect, the Toyota Tundra has been designed from the ground-up to be tough as nails. This pickup truck can handle all kinds of off-roading, hauling, and towing day after day without giving up. Whether you’re super active or just need something beyond normal durability, this is the ideal vehicle. It all starts with two available engines. The i-Force 4.6-liter V-8 packs 310 horsepower and 327 lb.-ft. of torque. Or you can choose the i-Force 5.7-liter V-8, which pushes a mighty 381 horsepower and 401 lb.-ft. of torque. To handle all that power, Toyota uses a huge 10.5-inch ring gear for the rear differential. That means a 4.30 rear axle ratio for maximum transfer of all that torque to the wheels. All models come with an automatic limited-slip differential standard. This high-tech setup works like a traditional limited-slip differential, only it applies the brakes at individual wheels when no traction is detected. With the largest engine, the Toyota Tundra can tow over 10,000 pounds (when properly equipped). * That’s plenty to take a boat to the lake, a big camper on an adventure, or do pretty much whatever else you want. A 38-gallon fuel tank means you can go further without stopping, so the fun doesn’t get interrupted. For the most extreme capabilities, choose the Toyota Tundra TRD Pro. It packs in especially tough features like a TRD-tuned Fox suspension, aluminum-forged BBS wheels, a special skid plate, Rigid Industries LED fog lights, and a TRD-tuned dual exhaust system. 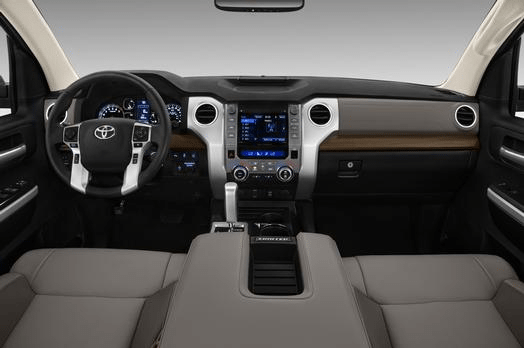 Even the onboard technologies for the Toyota Tundra are designed to help you get things done. They’re intuitive, so you’re not left guessing how different systems work. For example, the standard rearview camera just turns on automatically whenever you put the truck into reverse. Available integrated navigation works on the 7-inch color high-resolution touchscreen. It makes finding your way through the city or country a breeze. Of course, the Star Safety System helps you feel secure no matter where you venture. This suite of six advanced safety features like electronic brake-force distribution and vehicle stability control take a proactive approach to safety. Not only can you do more with the Toyota Tundra, the truck helps you relax whenever you climb inside. There’s plenty of room for up to five people, and everyone is surrounded by quality materials. Options like dual-zone automatic temperature control and leather upholstery boost your comfort to new levels. Armed with more knowledge of what makes the 2019 Toyota Tundra a great truck, now’s the time to act. Contact Pedersen Toyota to schedule a test drive and check out this pickup in person. *Before towing, confirm your vehicle and trailer are compatible, hooked up and loaded properly and that you have any necessary additional equipment. Do not exceed any Weight Ratings and follow all instructions in your Owner’s Manual. The maximum you can tow depends on base curb weight plus the total weight of any cargo, occupants, and added vehicle equipment. “added vehicle equipment” includes additional standard/optional equipment and accessories added by the manufacturer, dealers, and/or vehicle owners. The only way to be certain of your vehicle’s exact curb weight is to weigh your vehicle without passengers or cargo.